Black silk cord cuff. 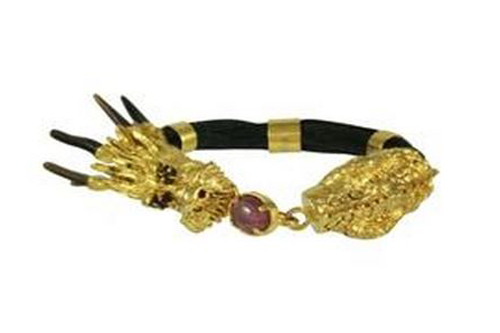 Clasp is made of sculpted dragon head and limbs, gilded in 24k gold. It is set with Faceted Garnet eyes (0.7 cts), an Oval Mozambique Ruby Cabochon (5.3 cts), and its head is set with horn shards.